A first-class trailer bearing masses of striking-looking blooms in a superb mix of colours including light pink, deep pink, rose, yellow and white. Ideal for pots, baskets and window boxes. Trailing 20cm. 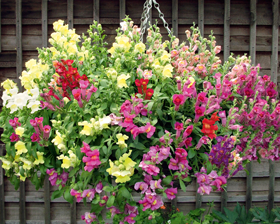 Sow snapdragon seeds January to March. Germinate at 20-30C on the surface of a good free draining, damp seed compost. Do not cover the seed. Place in a propagator or seal container inside a polythene bag until after germination which usually takes 10-21 days. Alternatively sow late autumn to get flowering in August next year.